At a wedding ceremony in Los Angeles this coming Saturday, poodle mixes Lily and Luna will walk down the aisle sporting pearl-white leather leashes and hand-crafted floral collars. A wrought-iron feeder and stainless-steel water bowls will await them at the reception, before the dogs cap off the night at a pet-friendly hotel. Increasingly, man’s best friend is sometimes also man’s best man—if not a ring bearer, flower girl or simply a member of the wedding party. To meet this growing demand, wedding planners, niche retailers and other businesses are offering new services and products geared toward helping pets fulfill their special roles. Mostly dogs but also cats, pot belly pigs and birds are getting outfitted with ornate wedding gear, including miniature tuxedos, veils and top hats. Trainers are prepping them for top performance and sitters are standing by for when the job is done. 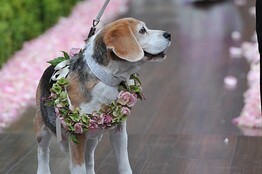 TheWeddingOutlet.com saw a 28% increase in sales of wedding accessories for pets last year over 2009. Founder Deborah Weckesser says the Stoughton, Mass., Web retailer has so far this year sold more items in that category than in all of 2010. Husband-and-wife team Dedi and Gary Wood of Plano, Texas, have been hired by six clients to oversee dogs in wedding ceremonies since launching Shadow & Marty’s Pet Care Services in 2008. Another couple, Sheryl Bass and Neil Cline of Palatine, Ill., sell for $130 a petal-dispensing wooden cart that’s hitched to a pooch to walk down the aisle. The pair invented the device so their Affenpinscher mix could be in their own wedding in 2006. “When I found the (pet) petal-pull cart, that turned out to be perfect,” says Sarah Dostal, a 26-year-old health-care worker in Ventura, Calif., who is getting married in July and will have her and her fiancé’s two Shih Tzu take part in the ceremony. Angel, a seven-pound, two-year-old, will serve as the flower girl, dispensing lavender rose petals. Hercules, an older Maltese-Shih Tzu mix, will act as ring bearer, carrying a $10 pillow she purchased at a crafts store on his back and fastened by a black ribbon with Velcro. “It will be like having the spirit of my mom there,” says Ms. Dostal of Hercules, whom she and fiancé, analyst James Darling, adopted from her mother after she died in 2009. Some pet owners bringing their furry kin all the way to the altar are following the lead of celebrities such as singer Carrie Underwood and actress Tori Spelling, who included pets in their weddings. Others simply aim to personalize their nuptials. “It brings in the personality of the bride and groom,” similar to another growing trend of couples making donations to their favorite charities in lieu of party favors, says Anna Pohl, owner of Day Planners LLC, an event-planning business in Sarasota, Fla.
Five years ago Ms. Pohl says she hadn’t planned any weddings with pets in them, but now she does about two out of 30 a year. 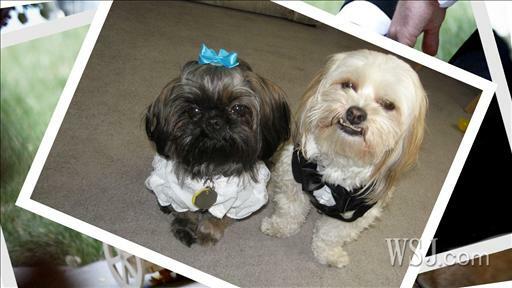 Even couples who invest in lavish weddings are incorporating pets into their nuptials. “You just have to be careful in how you handle them,” says wedding designer Preston Bailey of New York, who charges rates for weddings with or without pets starting at $200,000. In the past 12 months, he designed three weddings with dogs in them for the first time, he says. Accidents can happen even at well-planned ceremonies. Two summers ago, Nora Sheils watched in horror when nature called for a client’s West Highland terrier moments before the bride was to come down the aisle at her parents’ home in Portland, Ore. “There was a big gasp,” says Ms. Shields, owner of Bridal Bliss LLC, who plans eight to 10 weddings with pets a year out of an average of 60. Brides and grooms also run the risk of offending guests, and churches, synagogues and other venues often have a no-pets policy. Pets could also potentially upstage the bride on what is supposed to be her big day. Making sure everything goes smoothly can be costly. Los Angeles animal trainer Colleen Paige, who readied pets to participate in 15 weddings last year, charges about $2,500 per event and more if multiple pets and travel are involved, or if an animal is especially badly behaved. Another Cerritos Maltese Missing: Have You Seen Boba?